The month of July usually involves fireworks, barbeques and day trips to the beach. It’s the peak of summer; where the temperatures are high and the need for a summer playlist is even higher. 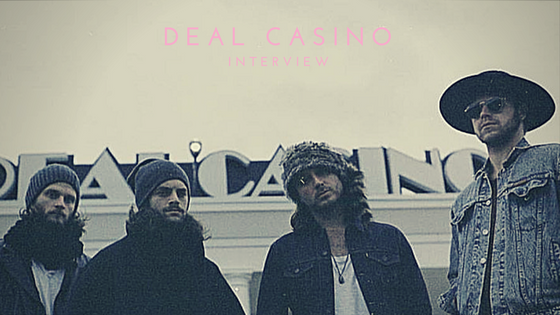 One record to put on that playlist should be the latest from Deal Casino. With this sense of comfort, they began with the Frigidus sessions. Originally they planned on making a live video to represent the EP and when an acoustic session was suggested, they knew that this was a challenge they had to accept. They created their own real definition of acoustic and rolled with it, ultimately creating a different look and sound to each track. The Frigidus videos are inspired by Pink Floyd’s Live at Pompeii and they wanted to create their own Pompeii in their hometown of Asbury Park, New Jersey. Although their version of Pompeii is in a brewery warehouse, it got that raw emotion that they were looking for. “It totally came across the right way with how the song ended up sounding; cold in the way [that] it felt slow and sadder than the record,” Cowell said. While July plans may include cookouts and 4th of July celebrations, four guys from Asbury Park are going to be releasing a record that comes straight from that positive creative environment. Whatever that record may be, it will include that Deal Casino vibe that belongs on that summer playlist.